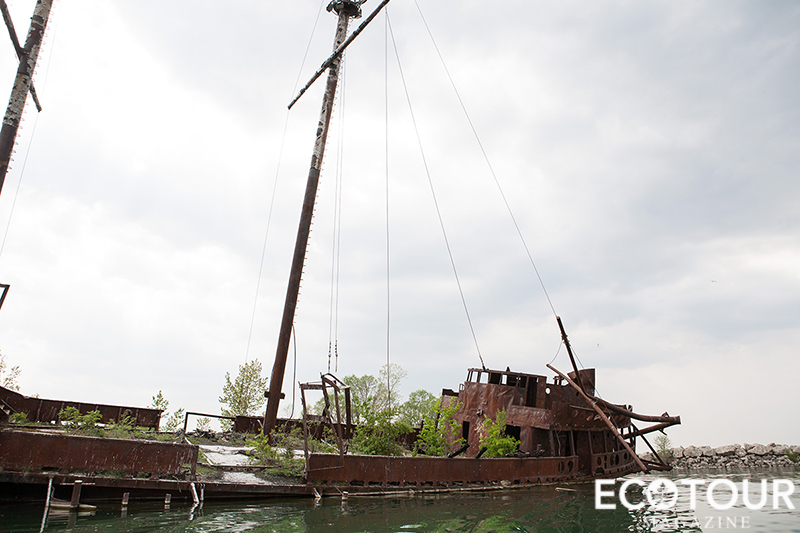 You may have seen the abandoned ship before, driving by on the Queen Elizabeth Highway towards Niagara Fall’s main attractions. 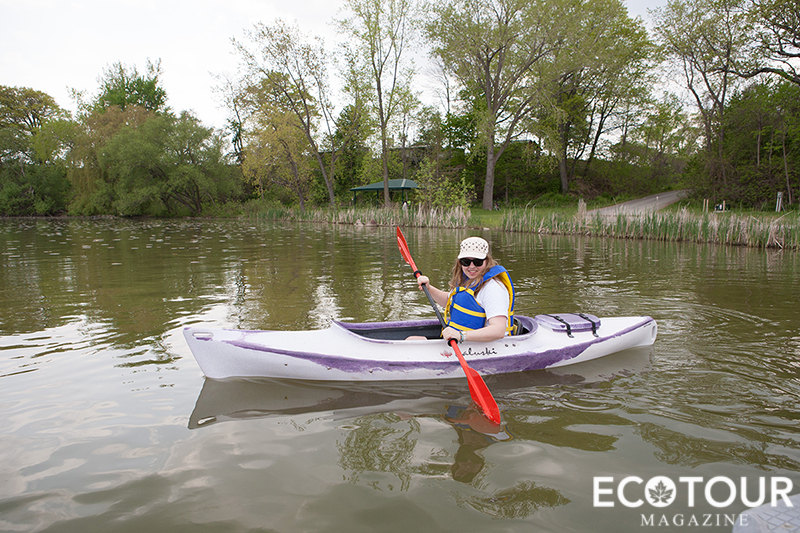 If you want to see it up close, like as close as you can get, be sure to paddle in the Jordan Harbour Conservation Area. 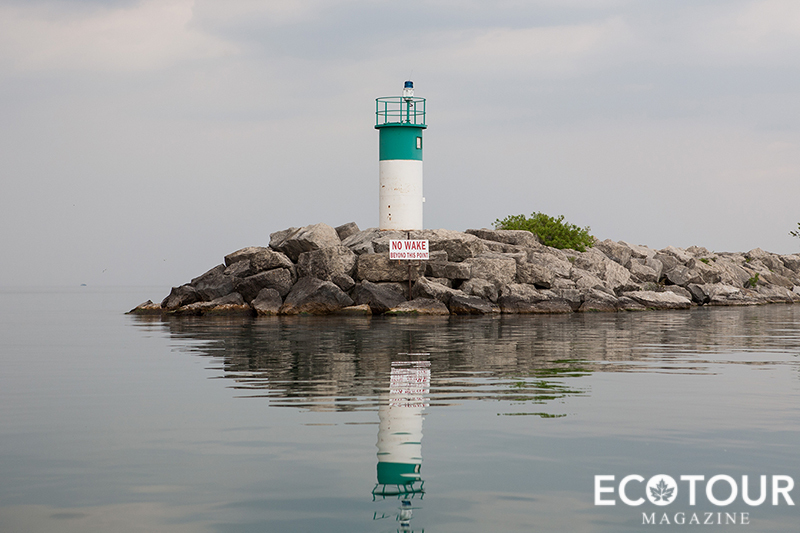 In this post, we share our experience of the Jordan Harbour, just a short drive from the roaring Niagara Falls and other popular attractions. 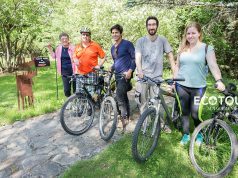 Based in the Twenty Valley watershed, we visited Jordan, a small but quaint town where Greg Parker founded his business, Niagara Rowing School. At the young age of 53, Greg told us, he fell in love with rowing, bought his first single rowing shell, and brought it down to the Jordan Harbour where there was a school. Four years later, and after purchasing a few more boats, Greg retired from his regular day job, where he managed a food processing company, and bought over the former school. He now manages Niagara Rowing School from mid-May into the mid-October. 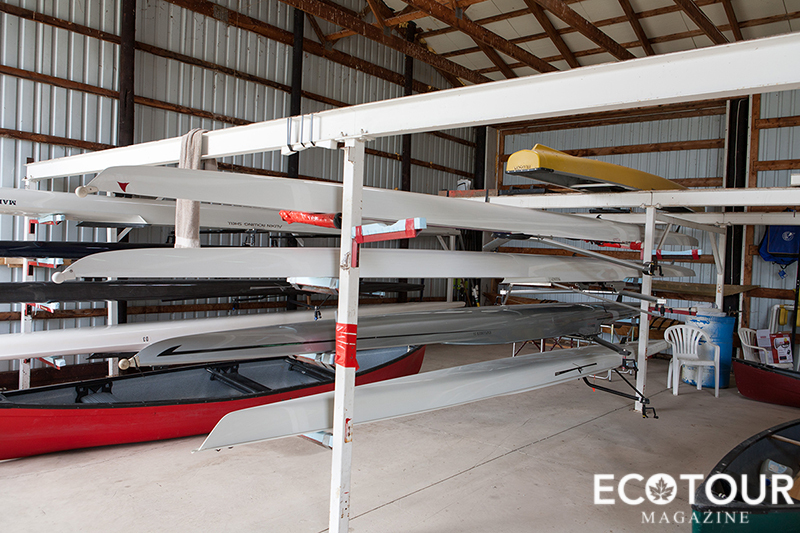 Catering to all ages, he runs a rowing school for adults, and a youth learn to row program from May to August, with 21 rowing shells, 13 kayaks, and 3 canoes available for rent. Greg helped Ben, Yegana, and I step into our kayaks, which he assured us were sturdy and unlikely to flip. Rest assured, they didn’t feel wobbly at all in the fairly still water. Greg then told us how to do basic paddling maneuvers: how to do a forward stroke, how to do a backward stroke, how to turn, and how to stop. It was all very easy to learn. 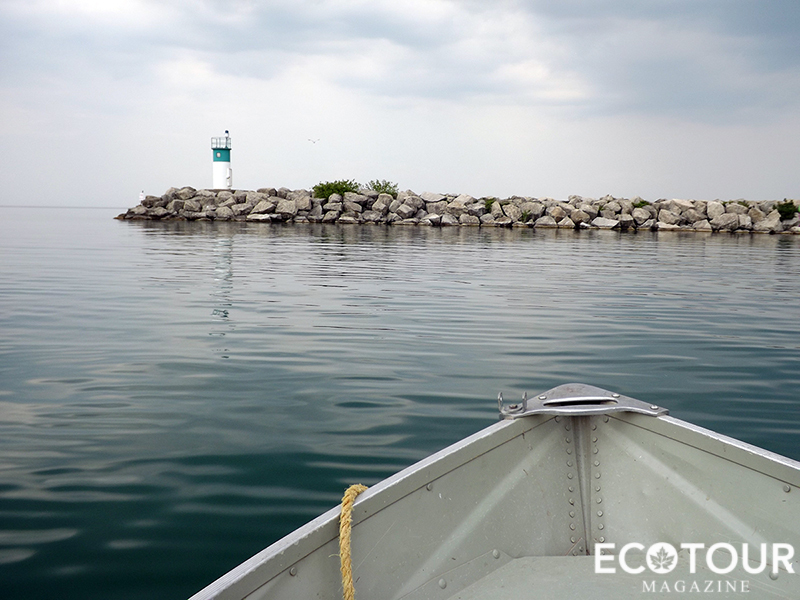 Once settled, he gave us two possible routes: The first was to head east towards an abandoned ship under the Queen Elizabeth Highway connecting to Lake Ontario, and the second was west to paddle towards the Owl Foundation with 50 cages built on the side of the harbour’s hill. 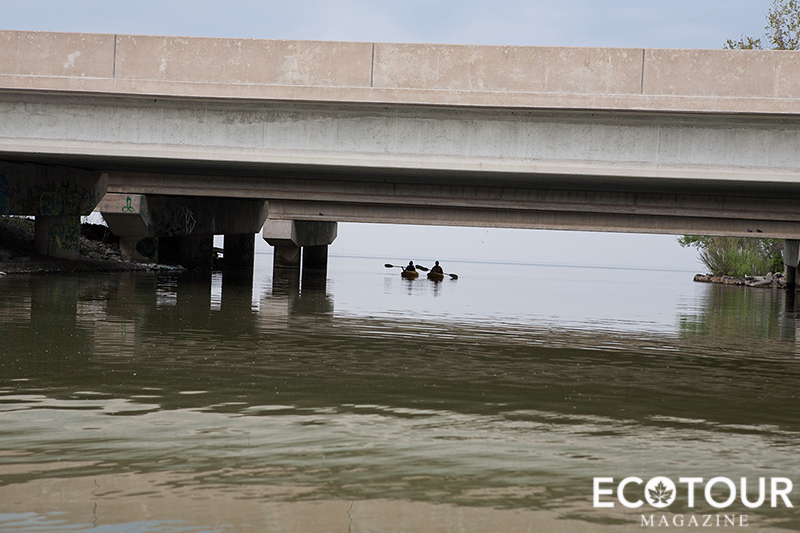 This time around, we decided to head west towards the bridge. 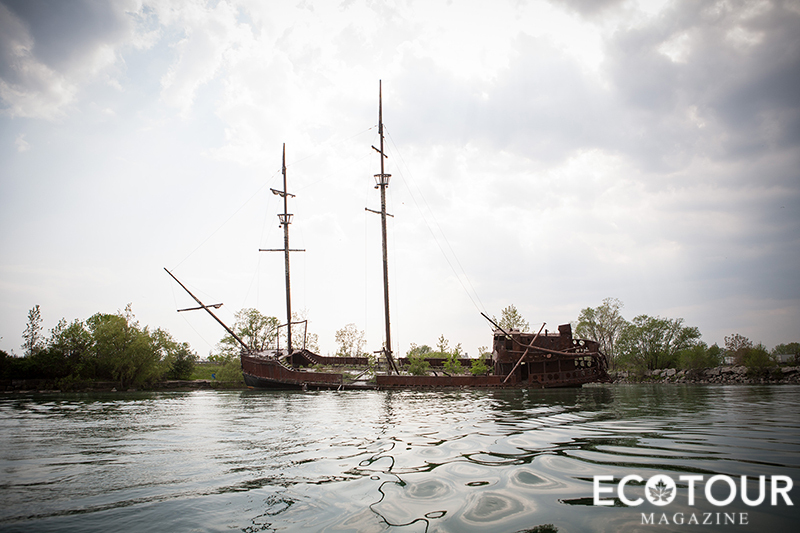 Last but not least, Greg showed us a recognizable landmark along the Niagara Queen Elizabeth Way (QEW) from Toronto – La Grande Hermine – a 140 foot abandoned ship is a replica of the largest of three ships that French Explorer Jacques Cartier used to sail the St. Lawrence River. On the way, we passed a picturesque teal and white lighthouse. As we pulled closer towards the highway, we could see the ship’s rust orange crisp structure, the result of a 2003 arson fire attack on this once-used cargo ship, that was built in 1914. 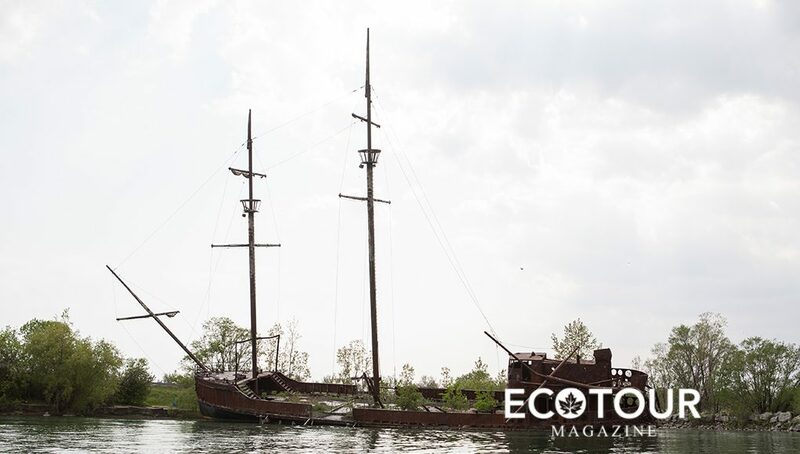 The abandoned ship tilted strongly to one side as it partially floated, and partially sat under the water’s surface, only just a few metres of the shoreline off the Jordan Harbour. Taking an even closer look, we could see shrubbery growing all across inside the ship, though it was unclear if this was a natural occurrence or not. 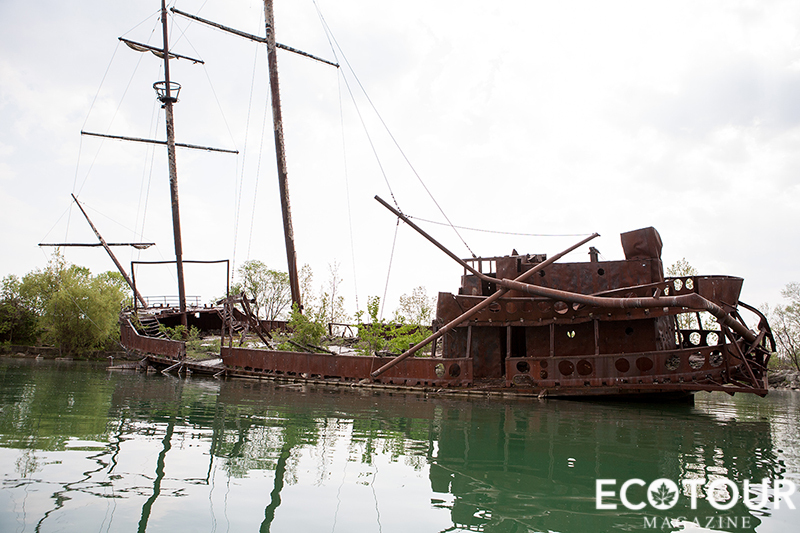 The ship with its rustic nature and greenery as well created a very unique setting for photos to complete our day. 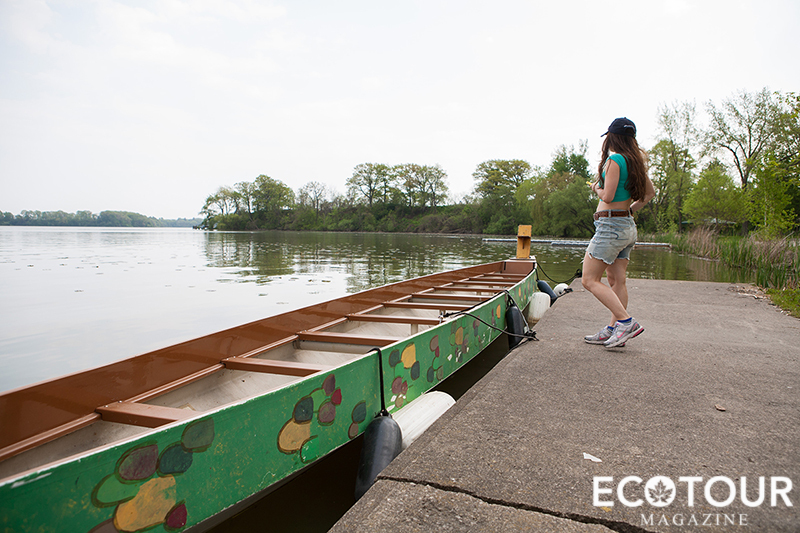 Niagara Rowing School offers leisurely 2-hour kayak or canoe paddling across the picturesque shoreline of Jordan Harbour, around the reed islands, and home of swans, geese, ducks, sunbathing turtles, and many more wonderful animals. 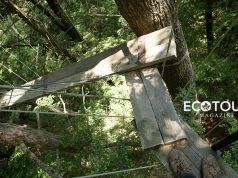 Remember that sharing is caring, and each article shared helps support our cause to raise awareness of eco adventure travel opportunities in Canada. Join our conversation on Facebook, Instagram, and Twitter for the latest updates. 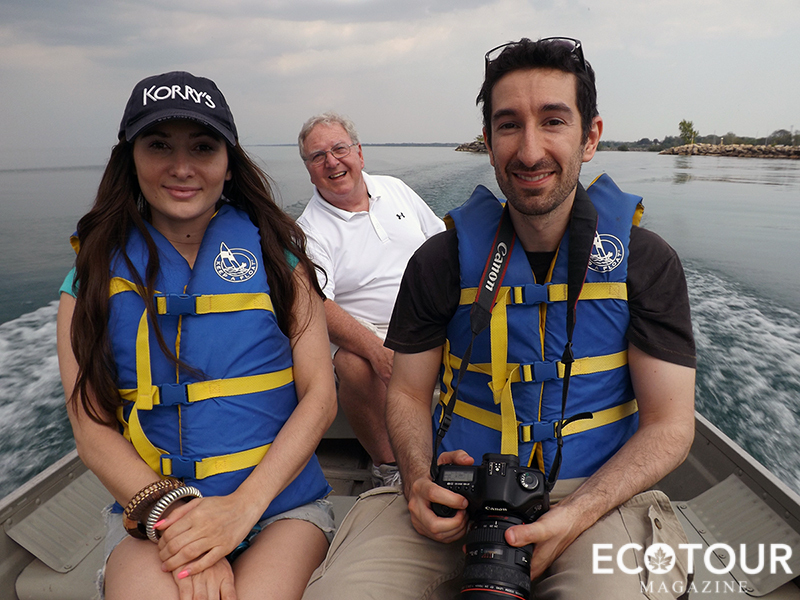 We really enjoyed our time spent with Greg on the Jordan Harbour, and think you will too! 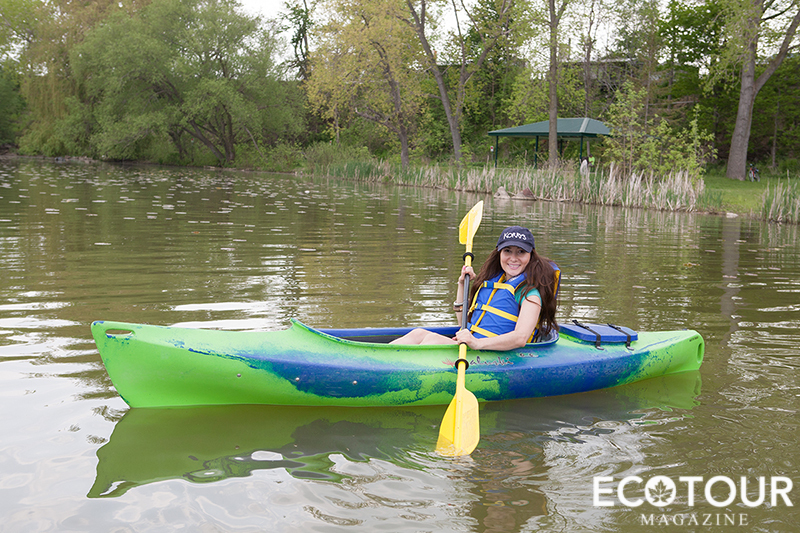 There are a bunch of kayak and canoes to choose from, including multi-person boats, so you have the choice of boating alone or in a group. 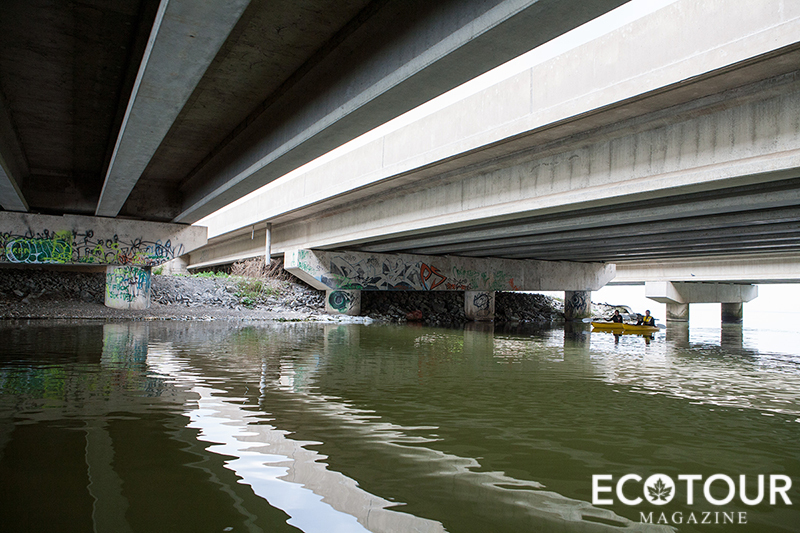 Greg is also very knowledgable about the nature and wildlife in the Jordan Harbour area, and can guide you in a direction based on what you want to see on your paddling experience. 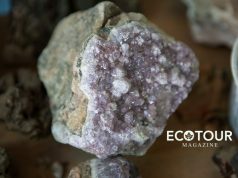 As Editor-in-Chief of Ecotour Magazine, Debra is excited to bring her over 7 years of experience in communications, content creation, and journalism, to help share Canadian Ecotourism stories with you. Debra has a Degree in Environment from the University of Toronto, a Graduate Certificate in Corporate Communications from Seneca College, and most recently studied Travel Writing at George Brown College. She was born and raised in Toronto, Canada.